On 3 March, 1891, Lewis Hosea (see biography of Lewis Hosea), a lawyer and amateur mechanic, and William Beardsley (see biography of William Beardsley), a businessman, both from Cincinnati, Ohio, obtained a patent for keyboard adding machine (US patent 447457). 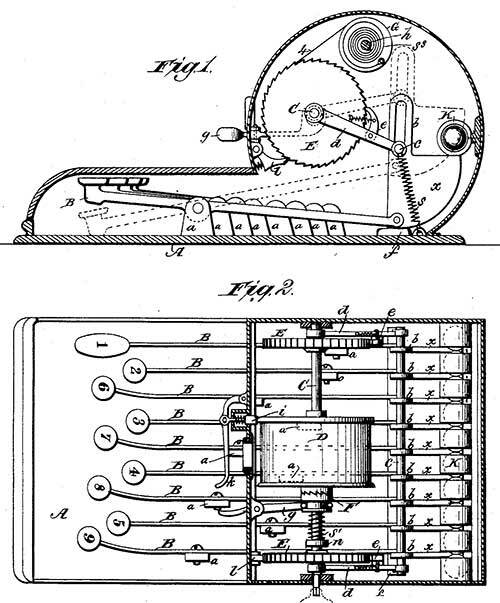 Let's examine the adding machine of Hosea and Beardsley, using the patent drawing (see the drawing below). The invention relates to registers or adding machines, its object being to produce a simple and compact hand instrument adapted to the use of book-keepers, cashiers, etc., for ascertaining the footings of columns of figures without incurring the uncertainty and labour attending the mental operations of addition. The invention consists in the apparatus, embodying, substantially, a bank of keys, placed in convenient relation to the thumb and digital fingers of a single hand, arranged to act selectively through transmitting and engaging mechanism upon a ribbon-drum, whereon is displayed a column of consecutive numbers, each of which in due rotation is brought into view, registering with a sight-aperture provided in the casing. The operator having the machine on the desk before him with the ribbon indicating 0, traces up the units column of figures with the eye in successive order from top to bottom, or vice versa, striking the appropriate key for each figure. The action of each key brings down the ribbon its appropriate number of increments, and the final reading will be the aggregated result. Suppose this to be 195. He writes down the 5 and proceeds to "carry" 19 as follows: Upon pressing the lever g and releasing the clutch F the reel tends to rotate the drum D and the ribbon back again to 0; but the present object being to stop the rotation at 19 (the carrying number) the operator controls the rotation by the lever k, in which a little practice insures facility to stop at the desired point and set the clutch F. Should the ribbon slip past the desired point, say to 10, the reading is brought up to 19 by striking the 9-key or by applying a thumb-nut m to the projecting squared end of the shaft C, as indicated in Fig. 2, and rotating the shaft and drum to the desired point. The machine being thus set to the carried number, the addition of the tens-column is proceeded with in the same manner, carrying to the hundreds, and so on to the last column. The figures thus put down with the result of the last column constitutes the footing.